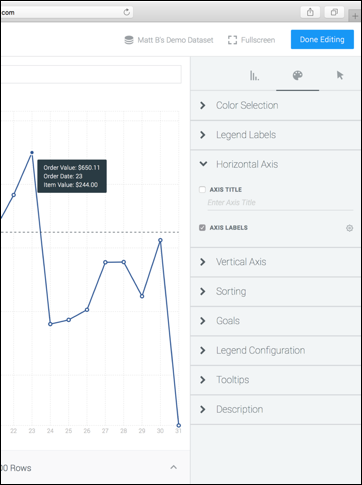 Numetric supports custom formatting of Metric labels, allowing you to display your data the way you want. 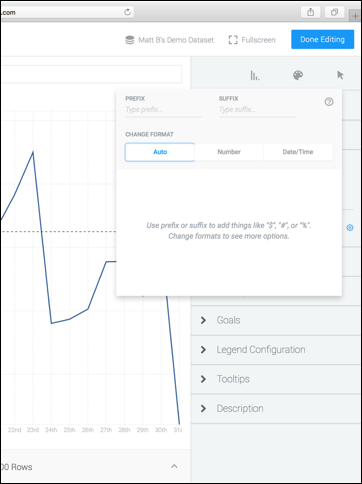 Custom formatting is available for the following labels in Metrics: horizontal and vertical axis (bar and line charts), tooltips (bar, line, partition, and pie charts), measure labels (KPI and partition charts), Goals (bar, KPI, and line charts) and column formatting (tables). To access the label formatting menu, edit the metric you would like to format, and click on the Presentation tab. Click on the heading for the label you would like to format. 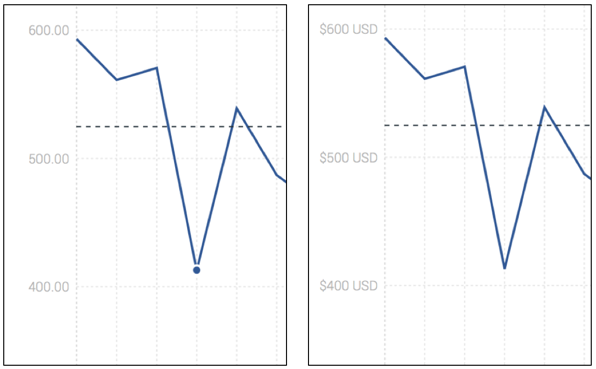 In this example we are editing the Horizontal Axis label. Click the gear icon next to the label, this will open the formatting menu. From the formatting menu, there are several different formatting options available, including adding a custom prefix or suffix and changing the label format. 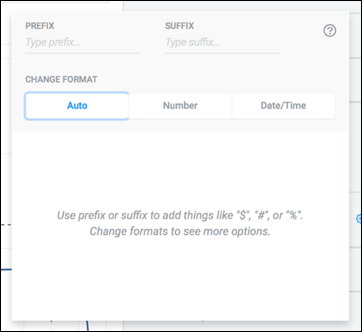 Under the Prefix and Suffix headings, you can add a prefix or suffix that will appear before or after all related values. For example, if the numbers on the vertical axis of your chart are dollar amounts, you can use the prefix to add a dollar sign ($), and the suffix to indicate that it is U.S. Dollars (USD). 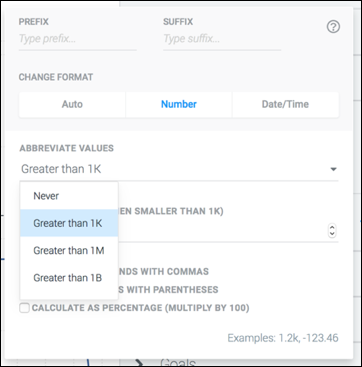 Once you have entered your desired prefix/suffix, you can simply click back on the metric to save and close your changes, and apply the new formatting to your metric, or continue to customize the label format. There are three label format options available to select: Auto, Number, and Date/Time. Selecting Auto will allow Numetric to determine the best formatting option. Numetric will use the Data Type to determine how to best display these values. If Currency is selected as the Data Type, Numetric will automatically add a dollar sign ($) and decimal with two decimal places (if applicable), if Date/Time is selected, Numetric will pull the default date/time format. Selecting Number will allow you to specify a number of formatting options unique to numeric data types (if Number is selected with Text values, it will not display correctly). Under the Abbreviate Values heading you can determine if you would like Numetric to abbreviate large numbers. You can select from Greater than 1K, Greater than 1M or Greater than 1B. When any of these options are selected, Numetric will abbreviate any displayed numbers as indicated (eg, 2,500,000 will be displayed as 2.5M). You can also select the number of decimal places that will be displayed in unabbreviated values by changing the value in the Decimal Places field. When selected, Numetric will round the number of decimal places displayed in the metric. It is important to note that Numetric will still store the full value of the abbreviated number, only the displayed value will be changed. 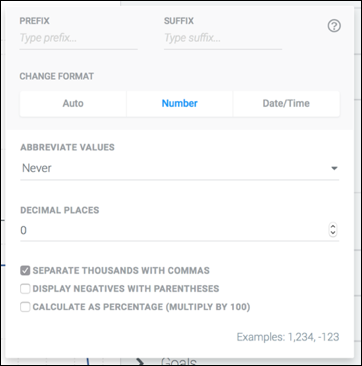 The final section of the Number formatting section allows for you to enable or disable the following formatting options: Separate thousands with commas, display negatives with parentheses and Calculate as a percentage (Multiply by 100). Checking the corresponding box next to each of these options will enable them, unchecking the corresponding box will disable them. The Date/Time formatting option will allow you to select how you would like to display date values (applicable for date, text, and numeric Data Types). 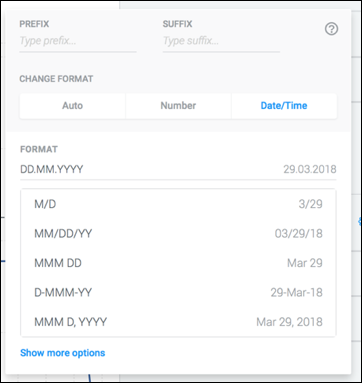 Here you can select from the list of available date formatting options, or create your own format by entering the appropriate format tokens (eg M for Month, D for day, Y for year, etc.). You can also include any other text or punctuation as desired. 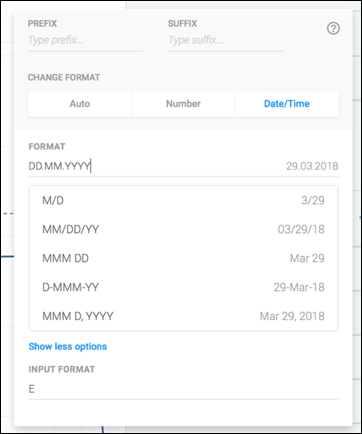 For example, if you would like your dates to appear in Day Month Year format separated by periods, you could enter DD.MM.YY into the format field and numetric will format your dates accordingly. If your data contains date values that are not automatically recognized by Numetric, (eg the ISO day of the week abbreviation 1 = Monday, 2 = Tuesday, etc. ), you can tell Numetric how to interpret the data by entering the correct token in the Input Format box, located under the Show More option at the bottom of the formatting menu.